The S4OPTIK 1800-CH Ophthalmic Examination Chair’s pneumatically assisted pivot tilting mechanism with one-handed release/control mechanism allows simple patient positioning with up to a 40 degree recline. In addition to featuring this Pivot Tilt System with convenient Tilt Release Controls, the 1800-CH features a strong, yet silent Power Lift System, intelligent Rotation Lock, robust Foot Rest, functional Armrests, sensible Height Control locations, and improved Headrest design. Pneumatically assisted tilting mechanism makes it easy to recline to any position (Maximum of 40 degrees). One-handed release/control mechanism for easy chair positioning. Powered by Swiss designed linear actuator for smooth and virtually silent lifting with a 500lb lifting capacity.The chair seat raises to 30” (76.2cm) and lowers to 22” (55.8cm). Rotatable to a full 360°, enabling maximum flexibility in patient positioning with locking ability in any position. Upholstered for comfort, and are individually retractable for patient flexibility. 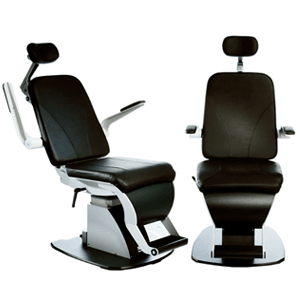 The headrest is height adjustable and upholstered for patient comfort. A large, broad and stable footrest provides safe and easy ingress/egress.